NVIDIA’s flagship GeForce® GTX 1080 is the most advanced gaming GPU ever created, powered by the new NVIDIA Pascal™ architecture. The GeForce® GTX 1080 comes with ultra-fast FinFET and high-bandwidth GDDR5X technologies, plus support for DirectX 12 features to deliver the fastest, smoothest, most power-efficient gaming experiences. Get the power to drive VR, ultra-high-resolution, and multiple monitors. Plus, bring more realism to every game with NVIDIA GameWorks™ technologies that deliver a true cinematic experience, smoother gameplay, and amazing new image-capture to share your game. All with the lowest latency and plug-and-play compatibility with leading VR headsets. 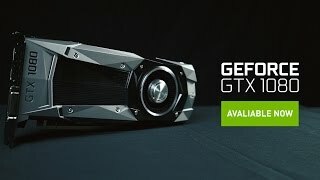 More links for "GeForce GTX 1080 "Founders Edition" 8192MB GDDR5X PCI-Express Graphics Card (08G-P4-6180-KR)"
I switched to this Card rather than wait for the FTW edition any longer,and i must say it was a great decision.The Card Overclocks well and achieves 60fps in 4K with slight setting tweaks in all games i throw at it.Compared to the 780 i upgraded from its so much better,dont wait for the 3rd party coolers just GET THIS CARD! Thanks to OCUK for the great service as always. Well the EVGA GTX 1080 does not disappoint. After ordering the card, a few days later upon opening the video card i was surprised to find a small packet of fizzy haribo sweets on top of the packaging, which i thought was a nice touch lol. But man after getting the card out of its box all i can say is what a awesome looking video card it is.But performance wise i can play any game at max settings in full 1920 to 1080p which is great for using a single card. EK-FC1080 GTX is a high performance full-cover water block for NVIDIA® GeForce GTX 1080 Founders Edition graphics cards.